Hey, people from Earth and other people who are not from here, for the next 12 weeks we will be giving you the awesomeness that is DIVERGENT by Veronica Roth. Be sure to show up, because we are giving away some goodies, check it out HERE. Just a side note, I will be asking a question after each discussion post. Be sure to follow the discussion and don’t be scared to join in on our discussion/ questions. Those who entered the contest will receive extra entries for answering a question. 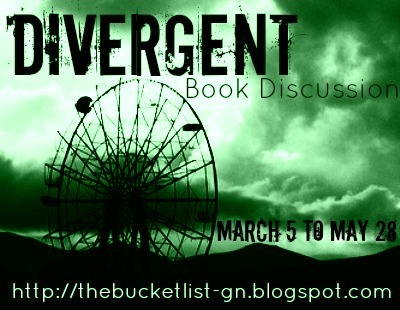 Every week on Monday, Wednesday, and Friday, we will discuss three chapters per week: tell you about the plot, and other random bits of spicy goodness that you should definitely know about (all relating to Divergent). 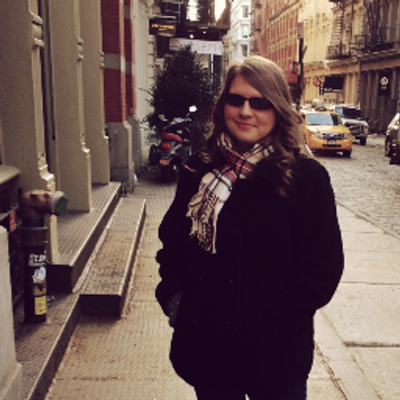 Just for your curiosity: helping me out with this discussion is Jackie, one of my best friends (please say hello to her). Basically these posts will be categorized by person. 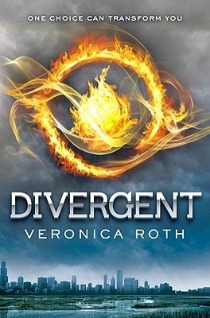 Jackie hasn't read the book so be sure to read her first impressions while she reads along and if you have read Divergent, be sure to read my input (this will be the my second read through). If you missed a post and want to check out the schedule, go HERE. Come and join us in our quest of discussing DIVERGENT. After returning home, Beatrice and Caleb have dinner with their family. It is the last night they will spend before the Choosing Ceremony. Beatrice is distrustful with everyone and won't even tell Caleb about what happened during the test. During the dinner, Beatrice's father comes home with some news spreading about Marcus, a coworker. Okay, this whole thing about Marcus is kind of based off of a rumor, so I am indifferent to what people say about him. This is what I hate about gossip. No one has the exact story of what is going on, and they ALWAYS add their own twist to the story (which is filled with lies, by the way). So, I will be able to better judge Marcus later if the accusations against him are true. Alright, usually I don’t get involved with the romantic couples in novels, but I bring Caleb and Susan’s relationship up for another reason. Abnegation means being selfless at all times. BUT, with Caleb and Susan, there must be some amount of desire there, which means they have to be at least a little selfish in order to feel this “want” for the other person. How does marriage work for the Abnegation then? I mean how can you be selfless in love, other than the fact that you would be willing to sacrifice your life or do anything for your significant other? I don’t know, maybe this isn’t that important, but I am curious about how Abnegation marriages go. Are they arranged? Maybe if Caleb or Beatrice chooses Abnegation I will find out. I am going to always dislike Marcus. No matter if they are just rumors. No matter if he apologizes a thousand times, I am never going to like him. That is all. There does seem to be something going on with Caleb and Susan but this is the chapter that you get to hear about different forms of Abnegation love. The family at dinner is the most prominent love. Beatrice mentions that her parents love each other but rarely show it. Even if they are in this faction, I still think one can show selfless love to another. Also, with Caleb and Susan, this is the day before they choose factions. They may not choose Abnegation; therefore, they can have these desires for the same reason Beatrice can speak at the dinner table. Another thing that we should definitely discuss is the first mention of Jeanine. From this point, we don't know much about her except that she may be spreading rumors about Marcus. Right now, we are wondering who this woman is. Any thoughts? How do you think marriages work in Abnegation? Is being selfless helpful or not, when marriage is concerned?